You won’t be surprised to hear that I’ve always been fascinated by Playfair puzzles. I know that they aren’t to everyone’s taste – Playfairs are the cryptic crossword equivalent of Islay whiskies – but I wanted to see if I could write one that had a wider appeal. The challenge is to come up with code words that are interestingly thematic but also comply with the Notes for Setters’ prohibition of anything that can be (easily) guessed from the theme. My initial idea was a puzzle that included lots of different quantum physicists’ names, plus cats both alive and dead, but I only started to make some progress when I settled on something less ambitious. Having limited myself to two names, finding pairs of words that differed only in their first letter turned out not to be as difficult as anticipated. 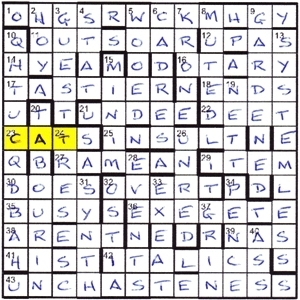 The trickiest part of the grid was the top left: there was no obvious alternative to QUEST / GUEST and everything else had to be fitted around that, which is why I in the end I had to resort to three-letter words for 2 and 14. If anyone can think of an alternative to QUEST / GUEST then I’d love to hear it! I also tried to make the cat’s final appearance more spectacular, but nothing quite worked. There’s not a lot you can do with C-A-T: if Schrödinger’s thought experiment involved a hamster or a ferret then I could have had a lot more fun. This was my first submission to the Listener and the original draft of the puzzle was very rough at the edges. At the risk of plagiarising every other blog, the final version owes a great deal to the skill and patience of the editors (patience especially, since the version I gave them to solve didn’t include the asterisks). A new setter this week, and one of everybody’s favourite features, the Playfair Code. On closer inspection, it’s actually Playfair Codes, so double the pleasure for our money. In fact, I know that it’s not everybody’s favourite, but I’ve grown to have a certain respect for them and don’t normally find them too daunting. Whether this week’s offering will be forgiving, only time would tell. On much closer inspection, the clues to be encoded were only clued by the extra wordplay letters in the clues. Not only that, they were long entries, 12 letters at 1ac and 10 letters at 10dn. A speedy zip through the clues, and the grid was filled. This gave us the two clues: I rode unsteadily in sewing machine, said g’day on Buddhist mountain. I wasn’t too sure whether the break in thte clues was at machine/said or machines/aid, although the former seemed more likely. Also, I wasn’t sure if the clues were in the order of 1ac then 10dn or the other way. SINGER was the sewing machine and BERG was the mountain, and those two elements enabled the answers to be swiftly scribbled in my notes: SCHROEDINGER and HEISENBERG. The two Playfair codes were polished off in extra quick time: PARTICLE and WAVE. OK, so that’s how it should have been solved!! Unfortunately, every step of the way took me a considerable amount of time. Each one which I have described as “speedy”, “swift” or “quick” seemed to take an age. The analysis of the two clues was particularly slow, having got into into my head that it was (I RODE)* in a sewing machine (which I really didn’t expect to be the Singer — ®), and I wondered if there was a holy Buddhist mountain that I’d not heard of. In the end, the clues were parsed as CH (I, dialect) RODE* in SINGER, and HEISEN (sounds like hi Zen) BERG (mountain). And, of course, the Playfairs weren’t really straightforward, since SCHOEDINGER could encode to NBQEQLMDOFHE or OHGSRWCKMHGY and HESENBERG to either QHTUCQDBAH or GBNOBMWBYM. It was certainly a way to make Playfair code-squares move from being tricky to diabolical, but I eventually got PARTICLE and WAVE. The latter was the harder since, unusually, most of the square was made up of letters not in the code-word. We were also helped by CAT, not BAT, being revealed by the coded 10dn. All in all, a real challenge for a puzzle near the year-end. Thanks for the duel, Agricola. PS No animals were harmed in the making of the animation! Oh no, not Playfair! We read the preamble and things only got worse. Somehow, we were to use wordplay that was going to emerge from extra letters in the wordplay of the clues to discover two thematic characters who were probably in some way going to duel. One apparently would have twelve letters to his name and the other ten. Their names were going to somehow suggest the code words and we had to use a different code word for 1 and 10. A thematic animal was going to appear that would resolve any ‘uncertainty’. (Good word, that! We have books about Heisenberg’s Uncertainty Principle, and Schroedinger’s Cat and the hint was there, but, of course, we didn’t spot it as we started solving). Yes, I read through the clues, as, even if, as seems to be the case, Agricola is a new Listener setter, I needed to justify his membership of the Listener Setters’ Oenophile Outfit. I didn’t need to read far: ‘Please bring booze: Earl scrapped cockfight (3)’. Hmmm – I’m not sure that surface reading told me much but we decided it had to be BYO (bring your own) and E, so a BYE had to be some sort of scrapped cockfight and the Big Red Book confirmed that. So what kind of booze was it? I skipped a couple of clues where we had ‘Yankee chases tea wrapped in gold seal (5)’ Yes, Agricola was getting into his stride now; that had a fine surface reading and was nicely deceptive, as the seal turned out to be an OTARY and not a cuppa that the Yankee was chasing (Y after T[E]A OR). Then ‘Tropical island mostly holds off site fouler (7)’ We worked backwards to NA[U]R(U) with SITE* to get NASTIER and now we had realized that those double clues were each giving us two words with only the first letter changing so TASTIER was the solution to the spumante clue, ‘Nicer bird drinking spumante (7)’ Ah the inevitable crosswordese spumante! It was a TER[N] drinking it but I think we can say cheers Agricola! Be careful not to overdo the alcohol though! Towards the end of the clues, ‘Mouths muddled exclamations, half-cut (5)’ (exclam)ATIO[N]S* giving OSTIA sounds as though all that alcohol didn’t go down too well. Maybe you’ll be at the setters’ dinner in Paris in March drinking something of better quality – see you there! We solved steadily, some fairly compact and amusing clues and a couple I moaned about, ‘Trials without charity for eczema sufferers (4)’. The other Numpty was muttering at me ‘Look up that eczema charity on the Internet’ but it was a while before we found NES which, with W/O produced WOES and an extra N, and we guessed at KRONE (which was confirmed later by the Playfair encoding) but still don’t understand the clue ‘Earlier paper about Copenhagen interpretation of Bible cut just after betting game (5) Twelve words to produce five letters? Hmmm. (The other Numpty tells me that clue is thematic, in that the Copenhagen interpretation was part of an argument about the foundations of wave particle duality and that ultimately, it doesn’t seem to matter, as they are the same). Enough muttering! After a couple of hours we had two sets of wordplay: I RODE UNSTEADILY IN SEWING MACHINE and SAID G’DAY ON BUDDHIST MOUNTAIN (yes, it could have been ‘IN’ as we still hadn’t sussed the KRONE clue). Sewing machine? Well I have a lovely little Husqvarna, but that has too many letters and Elna has too few. Must be SINGER. SCHROEDINGER has a fine anagram of I RODE in it but that doesn’t quite work. There’s an extra I and that CH to justify. Oh, clever Agricola! Chambers tells us that CH is an obsolete dialect form of ‘ich’ or I. By this time, the other Numpty was downstairs watching the snooker but he’s the physicist and when I shouted down “It’s HI ZEN BERG – a “heard” clue giving HEISENBERG”, he nonchalantly shouted back “Then the key words are PARTICLE and WAVE”, and, of course, they were, as was demonstrated by the Braingle Playfair solver minutes later. Quinapalus does the same. It is amazing, I think (and I have no qualms about using such resources even if I admire those who work out the Playfair for themselves). Entering just two pairs of letters gives that string of possible key words and, of course WAVE and PARTICLE are there. The Internet tells me that the particle belongs to Heisenberg and the wave to Schroedinger, who was a wave-mechanics man, but there is supposed to be a thematic animal appearing to resolve any ambiguity and, of course, when I select the right set I find, not a hare (Schroedinger’s hare? No, Schroedinger’s bat? I wonder how many solvers will enter that!) There’s his CAT to highlight. Nice! I love the way the Playfair game was thematic. What a fine debut, thank you, Agricola. The Poat hare? A fellow solver sent me an amusing email before even beginning to solve. ‘Bet you a glass of wine in Paris that the duelling pair are the Tortoise and the Hare.’ (Nice idea but he lost didn’t he!) But is it really fair to hide the hare in the clues? ‘One local hare among game lacking purity (12)’ and what self-respecting hare would be among that gone-off venison or whatever? Of course the game was CHESS surrounding [H]ASTEN giving us UNCHASTENESS. However, it was the cheeky little fellow climbing up the grid towards all those DOES that had appeared in the endgame who caught my fancy. incorporated Tolkien’s ENT (for ‘tree guardian’) around ROO (for ‘forester’, a type of kangaroo), giving ENROOT, to implant firmly. Solving this puzzle was greatly helped by the use of very precise definitions from the BRB – these made it much easier for me to double-check answers. And in the finished grid, how many Easter Eggs could you find? Ok, I’m getting desperate now! Thorin’s HOOD at 10ac, maybe? And in Row 11, I thought that elven way-bread stuff was LEMBA, not SAMOSA? I’m confused! A quick solve but good fun nonetheless. Must be in one of the five or so easiest Listeners of 2017, though that’s definitely not a complaint! Thanks Salamanca! Now time to return to December’s Magpie magazine – which I’d highly recommend to any reader out there who enjoys The Listener but doesn’t yet subscribe. There’s at least a couple of pretty tricky ones I’ve still to (try and) solve!